Zinkwasi lagoon just north of Durban hosted The Starboard PRIMI sponsored second leg of the national SUPSA Race Tour on the 16th of June. 10km pure flatwater, with a handful of buoy-turns, thrown in, for the spectators to keep abreast with proceedings. The Johannesburg contingent of Anton Nel and Gunter Berger once again made the trek down to challenge the Durbanites. From Cape Town the mens field was represented by Dylan Frick while Brigette van Aswegen (ISA representative 2012) and Mishka Steyn had also stuck around from the SA Wave champs the weekend before. 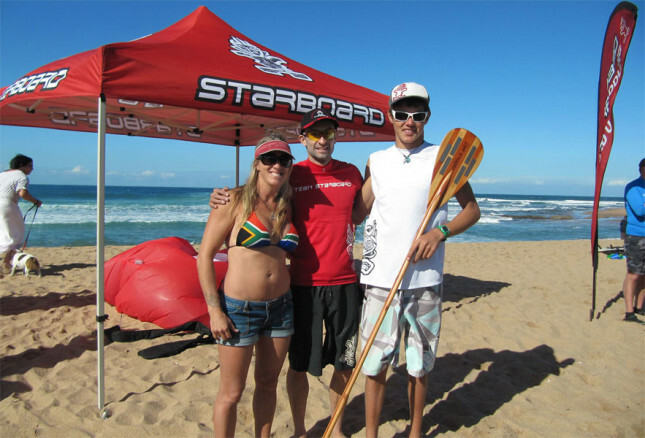 The Durban crew was headed up by the Read brothers, Brandon and Grantley and Shelley Bradfield (ISA representative 2013) on the womens side. Dylan Frick surprised no-one when he surged to the front and immediately set up a comfortable cushion and controlled the race from there. He’d gain further at every buoy turn and the real race was for second. The lead for second shifted several times between Gunter Berger and Anton Nel with the Read brothers hanging on till the end. In the end Anton Nel took his second second in a row and he is now the points leader on the SUPSA Tour as Dylan missed the first race. Shelley Bradfield blew away the competition and finished 9th overall 4 minutes ahead of Brigette, who was just ahead of Mishka Steyn. This sets off Shelley in a nice position to try and reclaim her spot in the South African ISA Team for Nicaragua 2014.